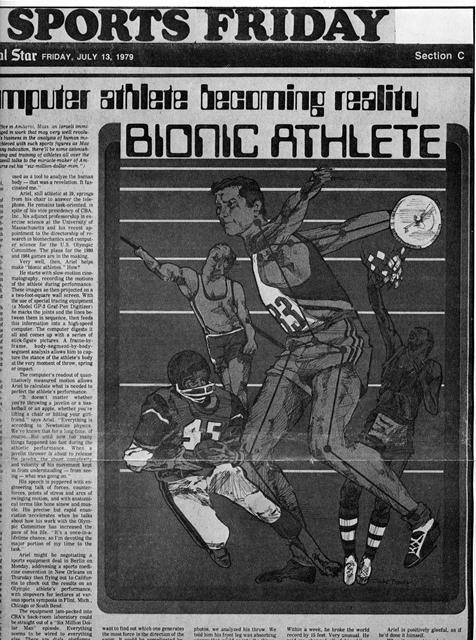 Because of Dr Gideon Ariei, athletes and athletics will never be the same. Ariei, who is in the business of analyzing human motion, operates out of a small office on Route 9 in Anther. t. Mass. The sign on the door reads. "Computerized Bioniechanical Analysis, Inc." Inside, the low hum of computers blends with discreet canned music. It could be almost any business office anywhere. But Gideon Arrel and CI4A are anything but anonymous. Terry AIbritton, the world champion shotputter, knows about them. So does Mac Wilkins. the world discus champion. The Kansas City Rovals, the Dallas Cowboys and the I' S. Olympic Committee know all about them too. CBA, the world's first reseach firm created specifically to analyze and evaluate the dynamics of human motion, was founded in 1971. One of the company's earliest projects was in find practical applications of these dynamics for the treatment of muscular dystrophy patients. Since then. Ariel and his associates have worked on the development of sports equipment and industrial equipment and in the areas of consumer and industrial safety. Arid talks a lot about witchcraft, but the images he calls to mind are not those of a horror filet. this is "Six-Mdhen-Dollar-Man" stuff. "Until now." he says, "mpst athletes relied on their coaches to tell them how to improve. The coaches had to rely on their eves to tell them what was going on. But the human eye cannot quantify movement. " Ariel, now a U.S. citizen, has been in the States for 14 years, but his Israeli accent remains pronounced "The most important things in athletic performance - timing, relative speeds of dozens of limb and body segments, changes in the centres of gravity - must be weighed. measured and compared to each other to be of any use." he continues. "Since you cannot see the forces with your eye. the best a coach can do is describe what a move is supposed to look like." used as a tool to analyze the human body - that was a revelation. It fascinated me." Ariei, still athletic at 39, springs from his chair to answer the telephone Ile remains task-oriented. in spite of his vice presidency of CBA. 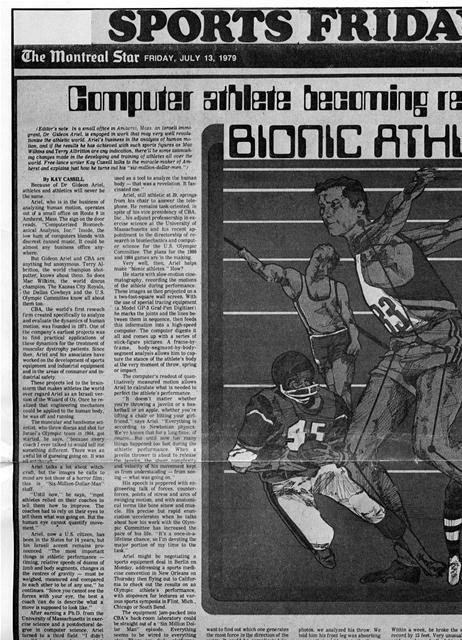 Inc , his adjunct professorship in exercise science at the University of Massachusetts and his recent-appointment to the directorship of research in bioniechanics and computer science for the U S. Olympic Committee The plans for the 1980 and 1984 games are in the making. His speech is peppered with engineering talk of forces, counterforces, points of stress and arcs of swinging motion, and with anatornicat terms like bone sinew and muscle. His precise but rapid enunciation accelerates when he talks about how his work with the Olympic Committee has increased the pace of his life. "It's a once-in-alifetime chance- so I'm devoting the inalor portion of my time to the task "
fflee in An,. ;,*s;	, :;, I.,% Israeli im,ni. ï¿½	and 1984 games are in the making. Very well, then. 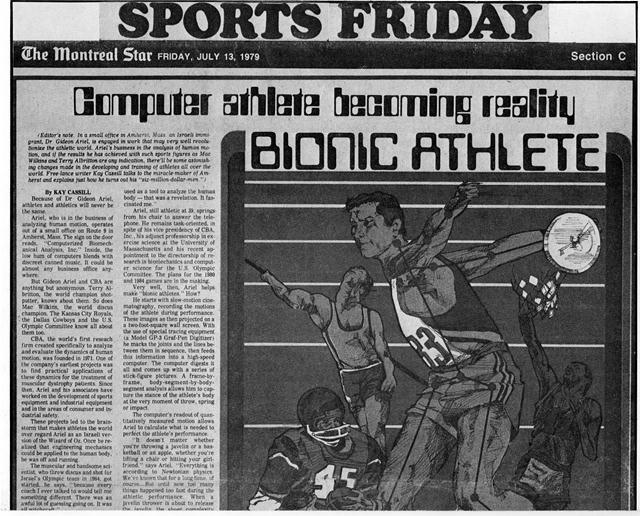 Arid helps make "bionic athletes." How"
and velocity of his movement kept us from understanding - from seerig -- what was going on "
ï¿½	major portion of my time to the task." ï¿½	ious sports symposia in Flint. Mich.. Chicago or South Bend. ï¿½	he straight out of a "Six Million Dollar Man" episode	Ecervti.ir4 seems to be wired ti ecr'ryt! :mR else. There are dials. i laifores. the most force in the dire'~:ion of the	told him has tr,w! Ivg ,,; s absorbing	record be 15 feet. Very unusual. He	he'd done it himself. Because of Lr Gideon Ariei. athletes and athletics will never be the same. ArieiA who is in the business of analyzing human motion. operates out of a small office on Route 9 in Amherst. Mass. The sign on the door reads. "Computerized Btomechanical Analysis. Inc." Inside, the low hum of computers blends with discreet canned music. It could be almost any business office anywhere. But Gideon Ariei and CBA are anything but anonymous Terry AIbritton. the world champion shotputter, knows about them. So does Mac Wilkins. the world discus champion. The Kansas City Ho yals. the Dallas Cowboys and the tl.S. Olympic Committee know all about them too. CBA, the world's first reseach firm created specifically to analyze and evaluate the dynamics of human motion, was founded in 1971. One of the company's earliest projects was to find practical applications of these dynamics for the treatment of muscular dystrophy patients. Since then. Ariei and his associates have worked on the development of sports equipment and industrial equipment and in the areas of consumer and industrial safety. used as a tool to analyze the human body - that was a revelation, It fascinated me." Ariei, still athletic at 39, springs. from his chair to answer the telephone. He remains task-oriented. in spite of his vice presidency of CBA, Inc , his adjunct professorship in exercise science at the University' of Massachusetts and his recent appointment to the directorship of research in bioniechanics and computer science for the U S. Olympic Committee. 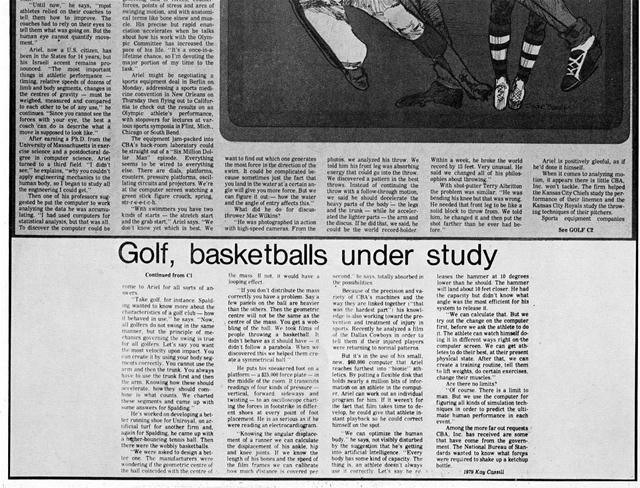 The plans for the 1980 and 19&1 games are in the making. "it doesn't matter whether you're throwing a javelin or a basketball or an apple, whether you're tilting a chair or hitting your girlfriend," says Ariei "t verything is according to Newtonian physic's. ~, "Until now." he says, "mpst athletes relied on their coaches to tell them how to improve. The coaches had to rely on their eyes to tell them what was going on. But the human eye cannot quantify movement, ..
Ariel. now a U.S. citizen. has been in the States for 14 years, but his Israeli accent remains propounced. "The most important things in athletic perfomiance - timing, relative speeds of dozens of limb and body segments, changes in the centres of gravity - must be weighedï¿½ measured and compared to each other to be of any use," he continues. "Since you cannot see the forces with )our eye. the best a coach can do Is describe what a move is supposed to look like." After earning a Ph.D. from the University of Massachusetts in exercise science and a postdoctoral degree in computer science. Artel turned to a third field "I didn't sec." he explains. "why You couldn't apply engineering mechanics to the human body, so I began to study all the engineering I could get." Ariel might be negotiating a sports equipment deal in Berlin on Monday, addressing a sports medicine convention In New Orleans on Thursday then flying out to California to check out the results on an Olympic athlete's performance, with stopovers for lectures at various sports symposia in Flint. Mich., Chicago or South Bend. The equipment jam-packed into CBA's back-room laboratory could be straight out of a '*Six Million Dollar Man" episode. Everything seems to be wired to everything else. There are dials, platforms. Counters. pressure platforms, oscillating circuits and projectors. We're at the computer screen watching a green stick figure crouch. spring, str-re-e-t-c-h.
want to find out which one generates the most force in the direction of the swim. It could be complicated because sometimes just the fact that you land in the water at a certain angle will give you more force. But we can figure it out - how the water and the angle of entry affects this." photos. we analyzed his throw We told him his front leg was absorbing energy that could go into the throw. We discovered a pattern in the best throws Instead of continuing the throw with a follow-through motion, we said he should decelerate the heavy parts of the body - the legs and the trunk - while he accelerated the lighter parts - the arm and the discus. If he did that. we said, he could be the world record-holder. Within a week, he broke the world record by 15 feet Very unusual. He said we changed all of his philosophies about throwing." With stunt-putter Terry Albritton the problem was similar. "He was bending his knee but that was wrong. He needed that front leg to be like a solid block to throw from. We told him, he changed it and then put the shot farther than he ever had before." Aries is positively gleeful, as if he'd done it himself. When it comes to analyzing motion, it appears there is little CBA, Inc. won't tackle. The firm helped the KansasCity Chiefs study the performance of their linemen and the Kansas City Royals study the throwing techniques of their pitchers. it hehaved in use." he says "Now. these segments and came up with some answers for Spalding "
platform - a $25.Slo force plate - in the middle of the room It transinuts readings of four kinds of pressure -vertical. forward sideways and twisting - to an oscilloscope chart mg the forces in footstrike in differ ent shoes at every point of foot placement Ile is ,,s serious as if he were reading an electrocardiogram. "We can calculate that But we try out the change on the computer first. before we ask the athlete to do it The athlete can watch himself dotug it in different ways right onahe computer screen We can get athletes to do their best. at their present physical state After that, we can create a training routine, tell them to lift weights. do certain exercises. change their muscles "
Among the more far out requests CBA. Inc. has received are some that have come from the government The National Bureau of Standards wanted to know what foreca were required to shake up a ketchup bottle. Generated on 4/20/2019 4:07:27 PM (PST) ADI/HQ/GBA/2019/ARIELCLOUD/v3.0.2018.0126.